Most Excel workbooks contain errors which in some cases lead to unpleasant “surprises”. 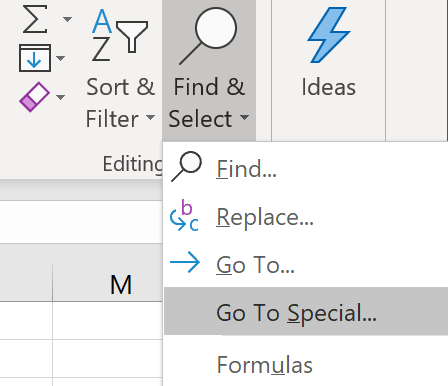 Spreadsheet errors come in many different flavors: Some of them are easy to spot but others are much more subtle: When you forget to update an external data source for example or when you copy a formula from the cell above instead of from the cell to the left. Or you end up counting some cells twice etc. etc. 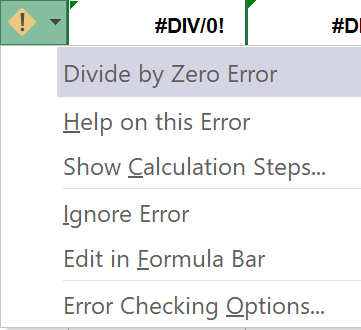 Since there are so many different errors, this blog post is concentrating on formula errors (as they are easy to find) and will leave other types of errors for future blog posts. #DIV/0! : A number is divided by 0 or an empty cell. #N/A: A value is not available to a formula or function. E.g. VLOOKUP doesn’t find a match. #NAME? 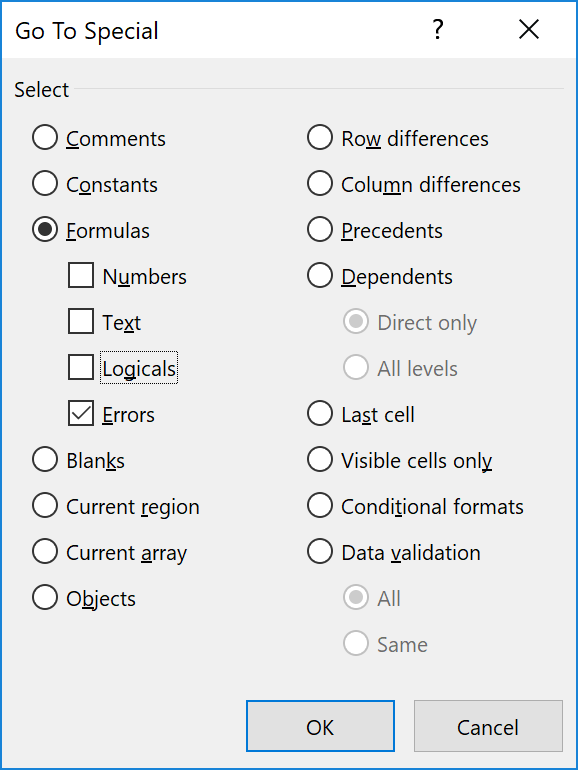 : Some text is not recognized in a formula. E.g. you use a named range with a typo. #NULL! : Intersection of two areas that don’t intersect. #NUM! : A formula or function contains invalid numeric values. E.g. if IRR can’t find a result. #REF! : A cell reference is not valid. E.g. you deleted a cell that is used in another formula. #VALUE! 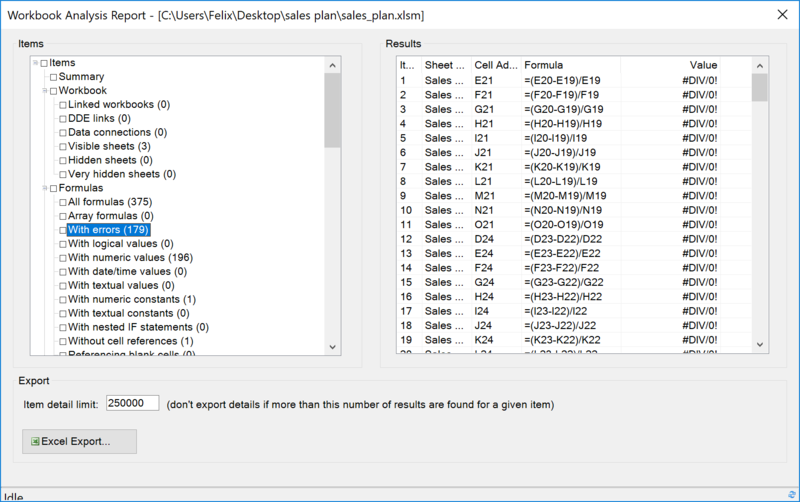 : Can occur if a formula contains cells with different data types. For example if you are adding two cells and one is a number and one is a letter. In the more recent versions of Excel, Microsoft has included the Inquire add-in. If you don’t see an Inquire tab in your ribbon, go to File > Options > Add-ins. Then, at the bottom under Manage, select COM Add-ins and click on Go.... In the pop-up check the box next to Inquire. The tab in the ribbon should now show up. An effective way to reduce errors and a good complement to automatic error checking are peer reviews. Peer reviews are standard practice in software development (i.e. a colleague looks at your changes before they will find their way into the code base). For Excel, this has been a difficult task for the longest time as there were no good solutions for version controlling and peer reviewing Excel workbooks. For example, the above screenshot shows how deleting one column (in red) introduced a lot of #REF! errors that can easily be caught in a peer review process. 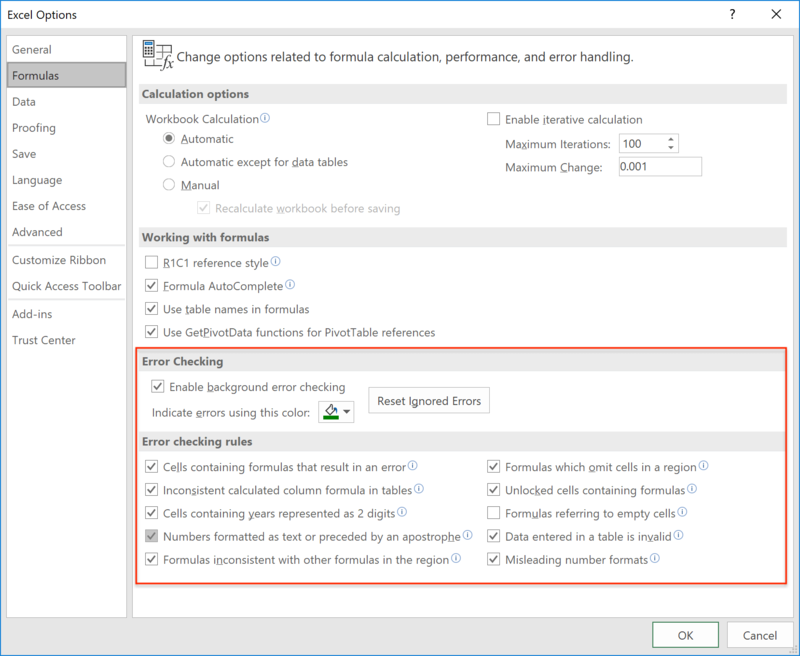 We have looked at a few different ways of how to spot formula errors in Microsoft Excel. Let us know in the comments below which method is your preferred one or if you use another technique to spot these type of errors.